SANATORIUM, TEXAS. Sanatorium is in Tom Green County sixteen miles northwest of San Angelo on U.S. Highway 87. It was never an incorporated town, instead, it was a relatively self-sufficient tuberculosis sanatorium. The postmark “Sanatorium, Texas” began with the opening of a post office on the campus in 1919 and disappeared on October 7, 1965, when the post office closed. 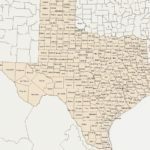 During the first decade of the twentieth century more than 4,000 deaths a year in Texas were attributed to pulmonary tuberculosis. In 1909 the Texas Senate passed a bill creating a TB colony, but it was defeated in the House. In 1911 both houses passed a bill creating two colonies-one for advanced and one for early cases-dedicated to the treatment and education of people infected with TB. Although plans for the former were abandoned, 330 acres was purchased near Carlsbad for the location of the Anti-Tuberculosis Colony No. 1. 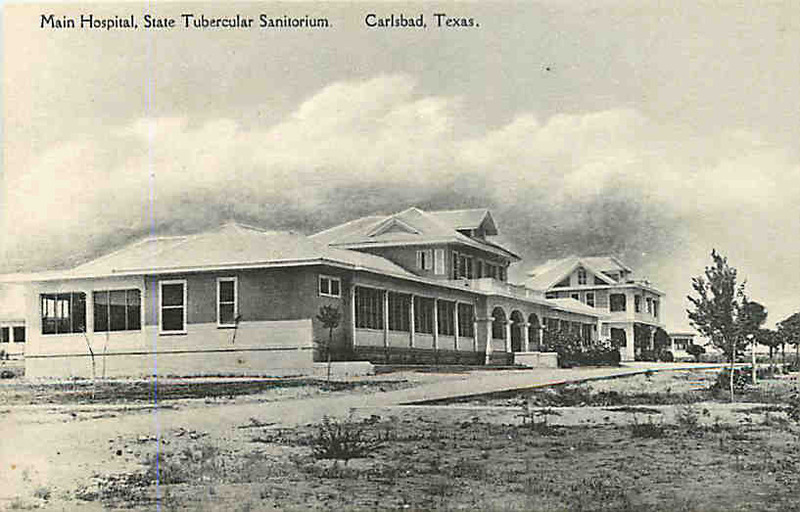 The first institution of its kind in Texas, the colony provided the isolation to calm the fears of the public, as well as rest and clean air, the only known cure for TB sufferers. Admission was restricted to patients between the ages of six and sixty for a period not to exceed six months. The fifty-seven-bed facility opened with a barbecue and celebration on July 4, 1912. Bascom Lynn, who commuted from San Angelo, was the first superintendent. In 1913 the facility was renamed the State Tuberculosis Sanatorium, and on January 1, 1914, Governor Oscar B. Colquitt appointed Joseph B. McKnight resident superintendent. Under McKnight’s leadership the sanatorium expanded for the next thirty-five years. Attracting employees was difficult because of the fear of TB, low wages, and geographic isolation, therefore, the Sanatorium School for Nurses in Texas was organized in 1915 to train the needed staff. The two-year training focused on TB treatment, and nearly all the students were recovering TB patients. The first class of four graduated in 1917 with a R.T.N. degree (registered tuberculosis nurse). In 1920 administration of the sanatorium passed from the Anti-Tuberculosis Commission to the Board of Control. By the 1930s the facility had treated more than 13,000 patients. From the original four buildings constructed at a cost of $10,000, the facility had grown to thirty-five buildings valued at $1.5 million. In 1930 there were thirteen buildings with 662 patient beds, including 162 beds in the children’s Preventorium. The grounds had been expanded to nearly 1,000 acres and included a post office, library, barber shop, dairy, hog farm, butcher shop, bakery, power plant, laundry, printing press with its own newspaper (the Chaser), four water wells, and a school for the children. There were also church services and organized meetings for the Masons, Order of the Eastern Star, bridge club, sewing club, and stamp collectors’ club. The complex had grown into a virtually independent community known as Sanatorium. By 1949 Sanatorium had grown to 970 beds with 300 patients on the waiting list. McKnight continued to propose expansions, including a new seventy-five bed dormitory, more employee living quarters, and a twenty-five bed surgery unit to supplement the existing surgical building constructed in 1947–48. Raymond F. Corpe, who was on loan from the United States Public Health Service, had begun to perform thoraco-plastic operations. The 1950s brought dramatic change to the institution. McKnight, who had become synonymous with the battle against TB, retired in 1950. On June 2, 1951, the Texas legislature renamed the institution the McKnight State Sanatorium. The ancillary operations such as the dairy, hog farm, and the Preventorium were systematically closed during the decade. The new superintendent, Dr. Allison, successfully removed the age-limit restrictions and the ban on readmission. But the biggest change was a result of the changing TB treatment. The old treatments, including bed rest and phrenic nerve paralysis, were increasingly replaced by the thoracic surgery program and such drugs as streptomycin and capreomycin. As a result the institution was renamed the McKnight State Tuberculosis Hospital in 1955. The length of stay was reduced from 372 days in 1960 to 311 days in 1961, 254 days in 1962, and 204 days in 1963. In the 1963–64 fiscal year the operating expenses of the hospital totaled $1,417,000. The 290 employees cared for a average of 388 patients at an average patient-per-day cost of $9.98. Changes continued in the 1960s. The nursing school, renamed the State Tuberculosis School of Nursing in 1938, closed in 1961 after graduating 501 nurses. The number of TB beds was reduced to 550 and the length of treatment continued to decline due to new drugs and surgery techniques. Staff now numbered around 100, including a chief thoracic surgeon, five resident physicians, and administrative personnel. After treating approximately 50,000 adult and 5,000 juvenile patients, the McKnight State Tuberculosis Hospital was converted to the San Angelo State School in September 1969. Medical techniques and drugs were now successful in more than 90 percent of TB cases, making Sanatorium and other TB institutions superfluous. The mission of the new institution was to serve the needs of mentally retarded men and women. San Angelo Standard Times, October 7, 1965. SOURCE CITATION: Handbook of Texas Online, John C. Henderson, “Sanatorium, TX,” http://www.tshaonline.org/handbook/online/articles/hls16.